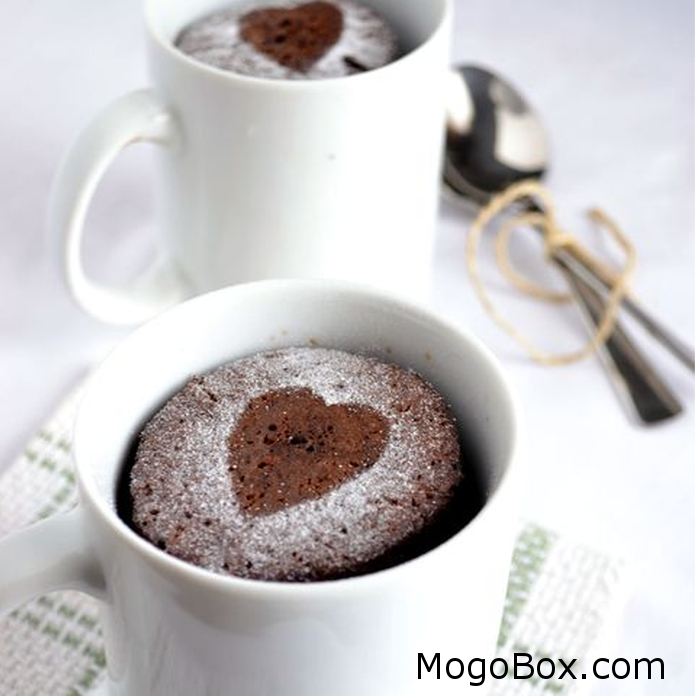 MogoBlog MogoLicious Tasty Tip of the Day: If you also like the sound of whipping up warm chocolate cake in 5 -minutes after school or after dinner, this Valentine’s day, check out how to make these delicious microwave chocolate mug cakes. Melt butter on the stovetop in a small saucepan set over medium hear or in the microwave in a small microwave-safe bowl. While the melted butter is still hot, add the chopped chocolate or mini-chocolate chips and stir to melt the chocolate. Keep stirring until well combined. Allow to cool to the touch. Whisk eggs, vanilla, sugar, cocoa powder, and salt into the chocolate mixture until well combined. Add flour and baking powder and whisk until just evenly incorporated. Divide batter evenly between 2 (11-ounce) mugs. Microwave to bake. Timing will vary greatly depending on the microwave. If using a very powerful microwave, I suggest working at 50 percent power and starting with 30 seconds. If the batter is still very liquid, cook for another 30 seconds and, if necessary, continue cooking in 10 second intervals. If working with a powerful microwave at 100% power, start with only 20 seconds and continue cooking in 10 second intervals. It’s better to cook in more intervals than it is to overcook this by cooking too long all at once. When done, the cake should have risen towards the top edge of the mug and should also look slightly wet around edges of mug and in the middle of the cake. (See video to get a sense of how the cake should look when done.) If these get too dry, the cake has cooked too long and may be spongy! Allow the cake to rest for 1-2 minutes before serving. *While there is nothing in this that is unsafe for younger eaters, I recommend it starting at 12-months-old due to the relatively high sugar content. No matter how older your eaters, consider serving age appropriate portions. A small amount of this sweet treat goes a long way with little ones. This entry was posted in MogoBlog, MogoLicious and tagged #MogoBlog, Chocolate Cake, MogoBox, MogoLicious, Mug Cake, Valentine's Day.